You may think we banned the sale of assault weapons to teens. But they’re still buying them. Classified ads for military-style semi-automatic rifles are selling to buyers under age 21 — even though a new voter-approved law supposedly banned such sales. If you’re like me, you probably thought that teenagers, at long last, were barred from buying assault-style rifles in the state of Washington. Twenty years after Columbine, and after some horrific mass shootings of our own committed by teenagers armed up with the firepower of soldiers, voters in our state last fall did what state lawmakers wouldn’t: They overwhelmingly banned the commercial sale of semi-automatic rifles to anyone under age 21. That law took effect Jan. 1. Or so we were told. 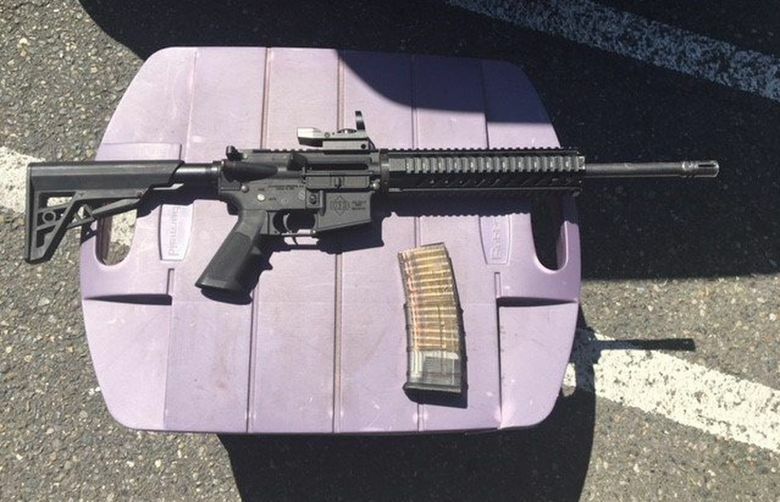 In other words: The seller, from Lynnwood, is openly advertising to sell a military style weapon to teenagers. And some gun shops still are willing to facilitate such sales (by overseeing it with a background check). All despite the voters supposedly banning such activities. You may have seen The Seattle Times headline recently: “Washington voters said yes to tough new gun law; at least 13 county sheriffs say no to enforcing it.” Well it sure looks like that civil disobedience by some law enforcement is having a tangible effect. A few gun shops around the state are openly continuing to sell so-called assault rifles to teenagers. The owners argue the new law isn’t enforceable because the definition of assault rifle was placed in a section of the law that doesn’t take effect until later, in July. “We can’t get in legal trouble for selling something that doesn’t legally exist, so we at Talos Tactical will continue to sell semi-automatic rifles to law abiding 18-20 year olds until July 1st, 2019,” announced the owner of a gun shop in Richland, in the Tri-Cities, last month. In a setback for the law, the police chief there sided with the gun-shop owner. As have some sheriffs in other parts of the state. “This initiative, as currently written, appears to be unenforceable due to the unclear language and lacking appropriate definitions,” said Okanogan County Sheriff Tony Hawley in a statement last week. Other sheriffs are going further still, saying they won’t enforce the measure because they think it’s unconstitutional (it’s being challenged in court for potentially violating the Second Amendment). On Tuesday, state Attorney General Bob Ferguson took these police chiefs and sheriffs to task. He argued they might even be held legally liable if they ignore the voter-approved measure and someone wrongly gets a gun and commits a crime with it. “The taxpayers of your city or county assume the financial risk of your decision to impose your personal views over the law,” Ferguson said. I have two big-picture reactions to all this. One is that the sheriffs are way out of their lane on whether the new law is constitutional. I don’t know what the answer will be either, but I can say that federal courts repeatedly have upheld similar gun-sale bans. Those courts ruled, essentially, that the Second Amendment gives you a right to bear arms, but not any arm, at any age (which is why it’s perfectly fine to ban, say, machine guns, or the sale of handguns to anyone under age 21). That said, it seems pretty clear the rebel sheriffs have a point that this law wasn’t quite ready for prime time. We just barred sales of assault weapons to teens, but the law doesn’t define what an assault weapon actually is until six months later? Yes, that’s a technicality. But there’s the spirit of laws and the letter of them. Both matter. This is why citizen initiatives can be lousy ways to make complex public policy. It’s the kind of mistake that likely would have been caught had it gone through the multiple hearings and markups of bills in the state Legislature. The gun-control side is winning the fight for public opinion. But it’s got to make itself more bulletproof than this.